Please be patient as we work to determine the best use, as a group, for this blog and the website. Like so many other things in life, much of our communications, interactions are occurring on Facebook. If you have any suggestions for the best way we can serve the CU Poetry community, please leave a comment below. Hi all! Here's a link to a list of poetry markets accepting electronic submissions. The list owner says it is updated regularly and that he verifies each link at least once a month. He indicates which take submission by email and which use a webform, e.g., Submittable. He does not, however, indicate which webform markets charge a submission fee so you'll have to find that out for yourself. At any rate, knock yourself out here. I'm dropping this in two days early because the deadline is May 1st. Free contest with cash prize, can't go wrong there. Pick from any of the online images and go! The Art Museum at the University of Kentucky and the University of Kentucky MFA Program in Creative Writing present The Kentucky Poetry Festival’s Ekphrastic Poetry Prize. 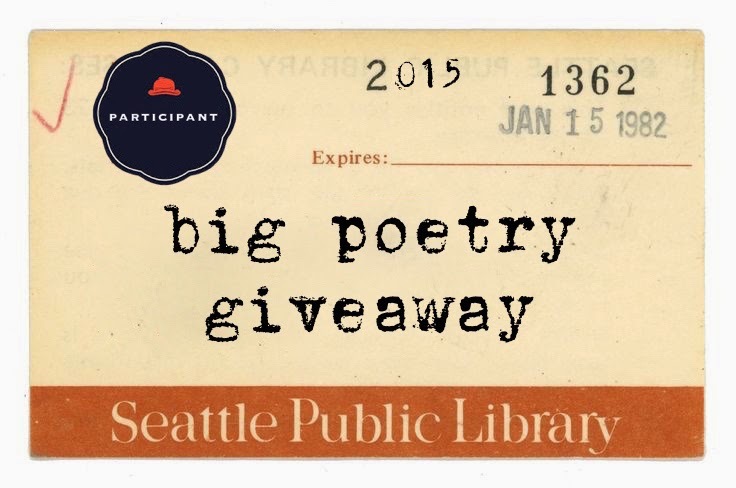 For poetry month we are participating in the big poetry giveaway. Kelli Russell Agodon: Book of Kells is again supporting poetry and bloggers by hosting the Big Poetry Giveaway. What is that? Simple - click on one of the many bloggers who are giving away free books of poetry on the book of kells site and make a comment and be entered to win a free book - including shipping. What are we offering here? Given Sugar, Given Salt by Jane Hirshfield and The Cradle Place by Thomas Lux. Both great reads by two of our prominent authors. Be sure to comment and enjoy! They will appear in Scream Online, an online arts/culture/literature journal that gets about 50,000 hits a month. The journal in the past has published poems by Dorianne Laux, Jared Carter, Robin Davidson, Tom C. Hunley, Helen Degen Cohen, Charles Fishman, Bruce Guernsey, Lola Haskins, Rick Hilles, Sharon Mesmer, and many others. Here's a link to the most recent mini-anthology: Heaven and Hell: 48 Poems by 37 Poets. What I'm looking for are poems talking about what you think about dreams or dreaming. The poems can be previously published or unpublished. Short prose pieces (prose poems?) would also work. As you all know National Poetry month is almost upon us and what better way to celebrate than writing 30 poems in 30 days - one for each day in April. For the last couple of years I have been taking the Poem A Day Challenge at the Poetic Asides blog. There are other challenges but I find this one a good fit for me. Do you have to put your poem on line? No. Keep it to yourself or share on the site - the main goal is to challenge yourself and write poems. Can't make it all 30 days? At least you got some new poems. Also for the second year, there are guest judges who pick a winner for each day. At our workshop this week, the CUPpers discussed the merit of submission fees and whether there is any justification in charging. Steve and I also discussed this in his hospital room. My immediate inclination was no, never pay for the privilege of submitting. Steve stated he has run across journals that only charge for electronic submissions. The rationale here is that the writer saves money on ink, paper, postage, etc. so should show their appreciation by chipping in a few bucks in the form of a submission fee. I still bristle at this. But then I found this journal, Black Heart Magazine, which gives submitters the option of a free submission or a paid submission, the difference being he paid submission will get a full editorial critique if the piece is not accepted but the free submission will only get a generic, form-letter rejection if not accepted. This seems fair to me since there is clear value to the paid submission. However, since I am in a dynamic and effective workshop group, I think I will skip the paid submission and be happy with the face-to-face feedback I get from people I trust. In either case, Black Heart Magazine is my recommendation for submission Sunday. Guidelines can be found here. I am also proud to note that one of CUPs own, Frank Modica, was recently published in BDM. His poem can be seen here. Congrats Frank! April’s theme is Hometown Stories/Open Call. Do you live in a small town? Are you dying to escape? Did you move to a small town from a large city? Is the quiet environment driving you crazy? If you have any experience with town gossips, goofy sheriffs, strange fundraisers or enjoy watching tourists stumbling around your town, please send us your stories. If you don’t have any experience with any of the above, don’t worry about it. After all, you’re fiction writers; make something up. The submission window for April closes March 1, 2015. The May/June issue is featuring a theme of Summer Vacations or Travel Stories. If you have never taken a vacation or traveled anywhere or never dreamed of traveling, then feel free to submit anything you have on hand. The submission window for the May/June issue closes on April 15, 2015. You’ve got plenty of time to take that trip and write your essay! There are a couple of reasons this journal should get your attention. First off, submissions are to be sent in completely blind with the poems, stories, essays, etc. in a separate document with no identifiers. This keeps the playing field level for new writers as each piece is considered on its own merits, not the merits of the writer's name. Second, they are one of the few markets to actually pay cash. Payment ranges from $10 to $70 on a sliding scale, according to their website. That's always a good thing. My guess is the higher end is for fiction or creative nonfiction. So it goes. A third and highly subjective reason I recommend them is they just notified me that they accepted one of the poems I submitted in December for an upcoming issue due out in July. So check out their guidelines, round up five of your best, and send them in.